2016 presidential hopeful Sen. Ted Cruz recently described a rally in Nashville as "one part political rally, one part prayer revival." Cruz made his comments while speaking to a crowd of nearly 1,000 at Nashville's Rocketown skate park earlier this week where his father, Evangelical minister Rafael Cruz, delivered his introduction. As Nashville Public Radio reports, Cruz also introduced local Tennessee minister Gaylon Wiley, who is credited with converting the elder Cruz to Christianity, as well as baptizing the younger Cruz. Cruz told the crowd of his father's first experience with Jesus after attending a Bible study in Tennessee, saying his father describes the experience as being similar to being "hit by a sledgehammer," with the encounter so riveting that the elder Cruz "dropped to his knees and he gave his life to Jesus." Cruz went on to thank Wiley for introducing his father to Christianity, saying, "the impact of one faithful servant spreading the Good News ripples for generations." Wiley then took the stage and offered a prayer to Cruz, to which the Texas senator responded that the political rally was "one part prayer revival." During his prayer, Wiley asked God for guidance as Cruz pursues the presidency, asking that the Lord "take the hands of this man and put the mantle up on him, that he might lead our land back to where we were, to the forefathers of our father and our mother." "Lord, he's been a good senator from my home state. He'll be a good president to all of our states," Wiley added. The Cruz campaign previously announced that it would be launching a national prayer team to carry out "A Time For Prayer" campaign beginning Dec. 1. "Heidi and I are grateful for the prayers of people all over this nation," Cruz said in a statement posted to his campaign website. "We experience the power of prayer every day. We're organizing 'A Time for Prayer' to establish a direct line of communication between our campaign and the thousands of Americans who are lifting us up before the Lord. Our nation is in desperate need of God's favor — these are dangerous days for America, but these are also days of great hope. United in prayer and in purpose, we are committed to reignite the promise of our nation," Cruz added. 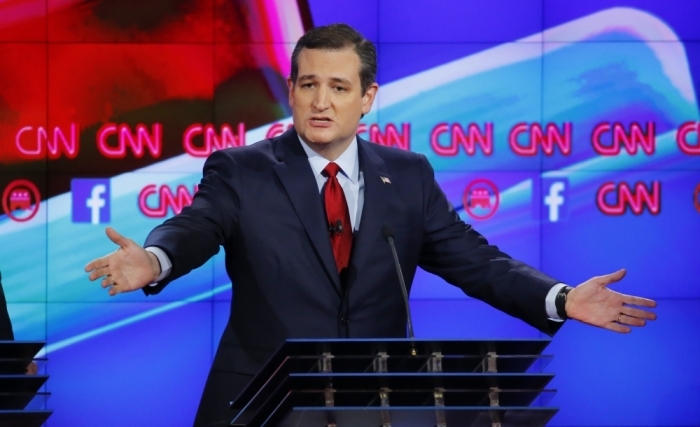 A new CNN/ORC poll puts Cruz as a trailing second behind fellow presidential hopeful Donald Trump. Although Cruz still follows Trump by a gap of 21 percent, he has gained 2 percentage points since the last CNN/ORC poll, taken in November. While Cruz has been outspoken about his Christian faith and roots, Evangelical voters have criticized real estate mogul Trump for being inconsistent in referencing his faith. Christian leaders have especially criticized Trump after he suggested a ban on all Muslims entering the U.S. following the recent terror attack carried out by Islamic extremists in San Bernardino, California that killed 14. Christopher Hale, executive director at Catholics in Alliance for the Common Good, wrote in an op-ed for Time magazine that Trump's stance on issues such as immigration go against Christian teaching. "We must counter Trump's statements about Muslims and immigrants that sow division and hatred in our nation with the truth revealed to us by the life, death and resurrection of Jesus Christ: that every human being is made in the image and likeness of God. Every person has the right to a dignified life, a home and a future. We must say it again and again so that a saint's old adage still rings true today: the truth suffers, but never dies," Hale wrote. "Christians must work against Trump and ensure Muslims are welcomed in the U.S., because as Pope Francis recently reminded us, they are our brothers and sisters," Hale added. Is Ted Cruz Like Goldwater or Reagan?